The one with the Calico Critters GIVEAWAY!!!! Woohoo!! It's the day after Christmas, but I'm still in the giving spirit! Today I am hosting an awesome giveaway for a Calico Critters family!! I've already stated in a lot of my blog posts my love for Calico Critters and a family is a great way to start a collection. This is one of the cuter families, too in my opinion! The Tuxedo Cat family is dressed to the nines with the girls in silk dresses and dad is wearing a suit. Calico Critters are great toys for imaginative play in kids. Plus they are just well made, wholesome toys. Nice! My granddaughter would like it. Theses are adorable, my nieces would love these! Very cute! I would love to win. I fell in love with Calico Critters this year and would like to get them for the children (or rather me) to play with. I'd like to start with some of the families and this was one I'd chosen already! Many thanks for hosting this giveaway! The Calico Critters are so adorable, would love to win! Thanks so much for putting on this giveaway. My three little guys are so into Calico Critters. 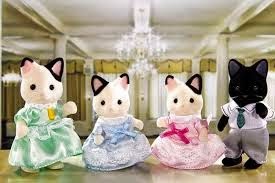 We are actually getting a vintage Calico Critters house tomorrow and these kitties would be perfect to fill it with! Thanks again! My grandsons would love this and grandma would play too! My daughter would absolutely LOVE these!! They are adorable! How do you like bloging. tell us about it.